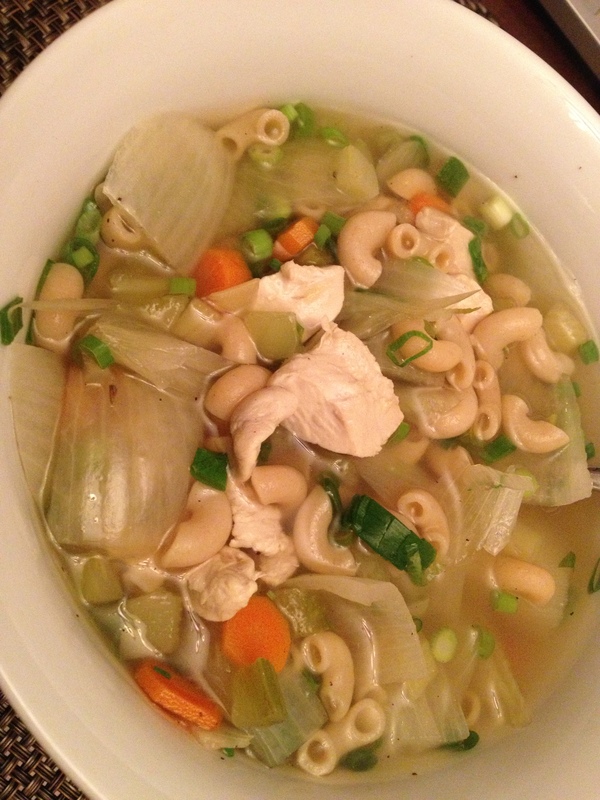 I love your delicious Chicken Noodle soup when I don’t feel right, the fennel and scallions you have really brings it home. But why does it have to cost me $1,000 / oz?! I don’t feel the love! So, I figured out the next best thing – a quickie version of your soup. Hope you don’t mind. Who wants to be chopping up stuff with a runny nose?! To save even more time, buy pre-chopped organic vegetables – Whole Foods NYC has some in their Produce section. – In a large stock pot, bring chicken stock to a boil on med to high heat. – Throw in sliced fennel, celery, carrots, & onions in boiling stock. Lower to medium heat and cook for 15 minutes, or until vegetables are tender. – Once vegetables are tender, place cubed chicken tenderloin in soup stock. Continue to cook for about 30 minutes or so until chicken is cooked through but not overdone. Stir occasionally. – Few minutes before serving, stir in the sliced scallions and macaroni. Salt and pepper to taste. Voila! Soups are one of my favorite foods throughout the year! With the right ingredients, you can have the perfect one-pot meal with protein, vegetables, and carbs. With the Northeast Fall / Winter already hitting NYC hard this year with Sandy and Nor’easter, it has left many of my fellow New Yorkers cold & hungry. During the aftermath of Sandy, without transit, I struggled to find a way to help our friends in Brooklyn / downtown – I especially wanted to contribute the way I know best, by cooking and feeding! Kid you not, soon after I arrived at my Upper West Side building I saw a flyer encouraging us “Uptown folks” to share a meal with our downtown neighbors at no cost! The organization is MealKu – The Home Made Cooperative. I quickly signed up, posted my “signature” winter “Italian Sausage & Tortellini Soup”, received a confirmation email that it was “ordered” and got a call for next day pick-up. They provided me with the containers needed (4 of these nifty bags were more than enough for a 12 person soup – wow!!!) and delivered to Red Hook Initiative. Easy peasy – THANK YOU MEALKU! Roughly separate the sausage in chunks, sauté the Italian sausage in heavy Dutch oven (with a drizzle of olive oil) over medium-high heat until cooked through, crumbling with back of spoon, about 10 minutes. Using slotted spoon, transfer sausage to large bowl. Add onion and garlic to Dutch oven and sauté until translucent, about 5 minutes. Return sausage to Dutch oven. Add stock, tomatoes, tomato sauce, zucchini, carrot, bell pepper, wine, basil. Simmer until vegetables are tender, about 40 minutes. Season soup to taste with salt and pepper. Cook the amount of tortellini or pasta you would eat in a separate pot. Ladle soup into bowls. Add cooked tortellini and serve! This soup can be prepared 2 days ahead (tastes better next day anyway), freezes and warms up fantastically for those single cooks out there. What is your favorite winter soup?